I’ve just moved my base here for a while to continue work on TalkInArabic.com and man oh man is it hot and humid right now. One of the things I hear a lot from expats living in the Gulf (places like Doha, Dubai and Abu Dhabi) is that they really want to learn Arabic but that it’s too challenging here. Before I came to Doha I met expats who had lived here for many years and never learned a word of Arabic all the while making excuses for why they couldn’t. As I concluded after living in South Korea, it simply astounds me that so many people opt to live in a part of the world long term without reaching even a basic level in the local language. Now I get that when you look at the demographics of a place like Qatar, it’s easy to just stick with English, stay in your expat bubble and live the Friday brunch lifestyle. Around 90% of Qatar’s population is foreign (aka non-Qatari). In Dubai around 70-75% of the population is non-Emirati. I can understand that for many people it’s a harsh and frustrating place to live, making the expat bubble a very tempting comfort zone to stay in. When you do see local Arab nationals in these places, they’re usually speeding around in their enormous 4×4’s or shopping in expensive stores. Blue collar workers, storekeepers, taxi drivers and so on are predominantly South-East Asian. It can be easy to forget where you are and stick with your own kin. It’s not hard at first glance to assume that Arabs are completely unapproachable in the Gulf (a wrong assumption) and even then they wouldn’t have the time or interest to practice Arabic with you anyway. My experience says this is not the case. I’ve had plenty of experience in Dubai (when I lived on Palm Jumeira with the Russians) and some here in Doha meeting local Arabs. Don’t let the money and opulence turn you off trying to befriend Gulf Arabs – for the most part they’re lovely, welcoming people when you take the first step to chatting with them. As an example, I was just recently buying a shwerma (Syrian sandwhich wrap) near my apartment and got chatting with a Qatari and his Tunisian friend in Arabic here in Doha. They were very friendly people. After a while chatting, not only did the Qatari guy want to hang out with me later but he also went so far as to offer me a job in his company and actually wanted to help finance and staff my own Arabic project as well. All because I took the first step and greeted him in Arabic (with a mouth full of shwerma)! I’ve experienced this kind of welcoming generosity and kindness time and time again in random encounters throughout the Gulf (of course I’ve met a few rich arseholes too but they’re everywhere in the world so who cares). Friends have told me of amazing generosity they’ve experienced (invitations to family events and dinners as well as extravagant gifts) because they’ve taken the time to befriend local Arabic speakers. This is not necessarily a wealth thing either in case you’re thinking that. 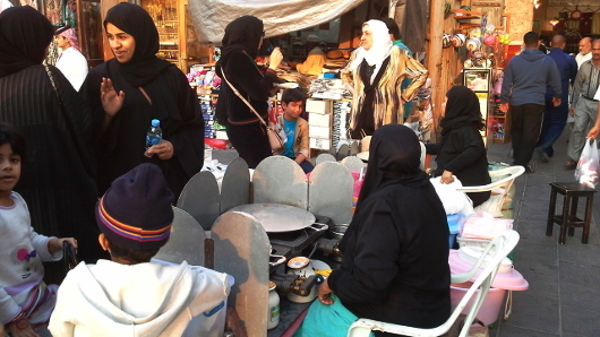 Hospitality is deeply ingrained in Arab culture which places you in high regard as their guest. Like people in most parts of the world, they generally love that you take an interest in their culture and language and will bend over backwards to help you with it. Outside of Egypt and Jordan I’ve probably had more opportunities to practice Arabic in Qatar than any other place I’ve visited or lived in the world. While it’s true that 90% of the population of Qatar isn’t Qatari, close to half of the expat population are still Arabs from other parts of the Middle East and North Africa. There are literally millions of expatriate Arabs living in the Gulf. If you live and work in Qatar or the UAE, I’d wager you almost certainly have Arab coworkers from places like Egypt, Jordan and Lebanon in your office. Many of the construction and hospitality workers in Doha and Dubai are native Arabic speakers as well who are always more than happy to practice Arabic with anyone (and would definitely welcome a few riyal for extra help). Just walking through some of the back streets around Doha yesterday I walked past loads of native Arabic speakers living and working in the area. North African Arabic speakers are always delighted to help me out when I chat to them here. The great thing about being here is that you have exposure to so many different varieties of Arabic in one small place. I’ve had days here just walking around the block in my area where I’ve spoken to Egyptian, Tunisian, Qatari, Algerian, Moroccan, Jordanian and Lebanese speakers in the span of just a few hours. You don’t get opportunities like that in many other parts of the world. This is very important for anyone serious about learning Arabic as there are a lot of dialects and it’s good to get that wide exposure to as many different varieties as possible while you’re learning. While it’s definitely a good idea to focus on just one dialect at a time, you’ll want to get used to the sound of the different varieties early on. That’s great for practice but who can teach me? There are loads of options for in-person study in Qatar and the UAE. The problem is that unless your company’s organizing it and picking up the bill, the courses tend to run in the thousands of dollars for short after-hours intensives and you can’t even be sure that you’re getting a quality teacher. Also most courses in the Gulf that are run through universities, language institutes and religious groups will teach you Modern Standard or Classical Arabic (I explained why this is wrong here). This is not a problem exclusive to this region either. It’s not always easy to find quality teachers who focus on spoken Arabic. For this reason, I highly recommend you use italki if you’re an expat living in the Gulf and wanting conversational Arabic lessons. When you consider the hundreds or thousands of dollars you’ll pay for class tuition in Qatar or the UAE (not to mention the hassle of transport if you don’t own a car), the many Arabic conversation partners and teachers you can connect with via Skype for as little as $8 an hour is a no-brainer. I’m getting back into my italki lessons for Moroccan Arabic this week and will be hitting up some areas of Doha where I know there are Moroccans to practice with. Are you an expat living in the Gulf? What’s your experience been like trying to learn Arabic here? Check out my Arabic self-study resource recommendations here and here, and some great ways to improve Arabic listening skills here. Also see my Essential Language Learning Tools page for other useful Arabic resources. Hi there Donovan! I’m Luiz Lucena and I come from Brazil. I’ll be spending 8 more months in the US, and my roommate is Morrocan. He told me he could help me with Arabic, and that I should learn Modern Standard first. Having learned some Indo-European languages before (English, Italian, French, and a few others), how much time should I dedicate on a daily basis if I decide to take on MSA in order to reach a low-intermediate (B1) or even an upper-intermediate (B2) in MSA in an 8-month span? If your roommate is Moroccan, that’s a perfect opportunity to learn Moroccan Arabic. Nobody speaks MSA as a native language anywhere. Plus your French would be a great help as Moroccan is heavily influenced by it. To reach a comfortable level of fluency in only 8 months you should be spending as much free time as you can spare each day to speaking it (not just studying). Tell your roommate to exclusively communicate with you in Arabic every day. “so many people opt to live in a part of the world long term without reaching even a basic level in the local language. What about those who only reach a basic level of proficiency even with trying? Well I wrote this primarily for people who complain about not being able to learn Arabic in the Gulf – people who make excuses. What’s your own situation here? I’d be interested to hear your experience and why you’re struggling to reach a higher level (I’m assuming you’re referring to yourself). I wasn’t referring to myself (although looking at my comment I can see how you came to that conclusion). I know and have encountered several people who have tried hard to learn a language either in country or outside of it and never got beyond a basic level of proficiency. Can you recommend an Arabic tutor in Doha? I feel I would benefit and learn at lot faster with one-to-one tuition. I would like to ask for your advice regarding Arabic in UEA. I’ll be moving to UAE soon (Abu Dhabi and Dubai) and would love to learn Arabic. Still I have a hard time trying to figure out which dialect should I study? Fusha could good starter but as I understand it is used exclusively in formal situations (like newspapers, tv etc.) so if my main goal is to communicate with colleagues in their native language dialect looks like a better option. Or maybe I’d be better off starting with fusha for 3 months and then focus on dialect? Is Gulf Arabic really used in the region? Im a cameroonian love moving to uae for job search.how can spoken and writen arabic be of help to my adventure.please need your advice. I have been learning Modern Standard Arabic (MSA) for about 6 months now here in London. I must say, for anyone looking to learn Arabic, definitely start with MSA. This will give you a solid foundation in this language. After you have learned MSA, then you can learn a specific dialect if you want to. I don’t believe in the concept of picking up words here and there and practicing with random people. The first step is to learn the grammar of this language, and really learn how it is structured for e.g. nominal and verbal sentences etc. This language goes really deep, and it’s very important we build a strong foundation before moving onto a dialect.